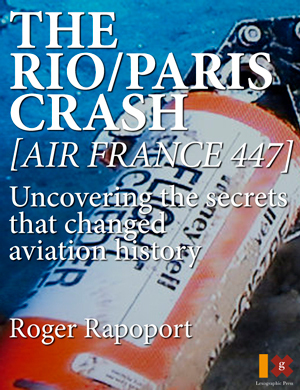 Roger Rapoprt does a good job of covering events leading up to the accident and the subsequent search for the missing aircraft, but the book suffers from being rushed to publication before the final accident report was released. Writing a book like this takes an enormous amount of time and effort. I should know. I spent over five years writing and researching my book 35 Miles From Shore about another airline disaster – the ditching of ALM Flight 980. There is no doubt that this is an intriquing story. A plane mysteriously crashes into the Atlantic. What happened? How did it happen? Where was the missing plane? But since the answers to many of these questions weren’t known for more than two years after the accident, the author was forced to speculate throughout. And had the plane not been found, that’s all anyone could have done, including me in my post, What Happened to Air France Flight 447? But all of us who speculated on the cause of the accident were mostly wrong. No one could have predicted that a plane that crashed and caused the loss of 228 soles had not succumbed to a catastrophic failure but instead was, for all intents and purposes, perfectly flyable. So the many pages dedicated to what might have happened loses much of its impact when the truth is finally revealed. There is still much in the book that has merit. The author goes into great detail on a number of subjects such as the history of fly-by-wire, the communication problems concerning the tracking of Flight 447, and the search for the missing plane. But the majority of the book was written well before the black boxes were found. In fact, you only find out what really happened in the final chapter, and here the author seems to rush through the final moments. The cockpit voice recorder transcripts are not provided. 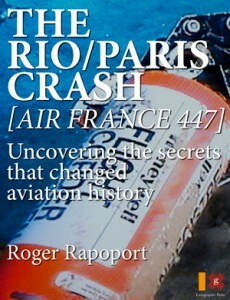 And the author completely overlooks several important aspects of the Airbus fly-by-wire technology that played a contributing role in the disaster, such as the fact that the computers average out sidestick movement, the fact that the throttle levers don’t move, and the role that the sidesticks might have played. Conventional aircraft, including some fly-by-wire-aircraft like the Boeing 787, have a yoke. If I’m pulling back on the yoke you can guarantee that everyone in the cockpit is going to know it. But the sidestick is like the joystick on a computer game. They’re located on the side console and mostly out of view from the other pilot. The two sidesticks are not connected. If the first officer pulls back on his sidestick, the captain’s sidestick doesn’t budge. If, however, the captain notices the plane climbing and decides that he wants to descend, his actions of pushing on his sidestick results in the computers averaging out the two opposing inputs. All of these things were important in this particular accident. In an earlier post I mentioned that the radar antennae had been set incorrectly. I got that information from another source who had misinterpreted the cockpit voice transcripts. It didn’t make sense to me that the captain would see severe weather on the radar but still choose to go in back for his crew rest. But that now appears to be the case. He saw the developing weather; made a comment about how it might get a little rough; then went in back to begin his crew rest, leaving the other two pilots to deal with the weather. Another factor that played an important role was the fact that the blocked pitot tubes were only blocked for a short time. At one point the relief pilot, Bonin, lowered the nose and the airspeed indicators, which had started to work again, signaled a stall. This caused Bonin to pull back on the sidestick. That combined with a negative vertical speed of more than 10,000 feet per minute contributed to Bonin continuing to pull back on the sidestick. There is a reason why pilots are never given more than one emergency at a time during training. When you combine emergencies the difficulty increases exponentially. Which emergency deserves the most immediate attention? How do the two emergencies relate to each other? There was confusion in the cockpit. This led to all three pilots not being able to analyse what exactly was happening. Going from normal law to alternate law at high altitude in the midst of severe turbulence, at night, along with numerous system failures,warnings, cautions and aural alerts, is an extremely difficult situation. It’s easy to look back after the fact and say all they had to do was apply the unreliable airspeed procedure and everything would have been fine. The truth, however, is that the multiple system failures combined with unreliable instrumentation made it nearly impossible to react appropriately. When problems arise, you look at what is presented and try to formulate a solution. But when the information presented is confusing, misleading, and unreliable, where do you start?